This is my tribute to an iconic metal band. I hope more people become aware of their discography. 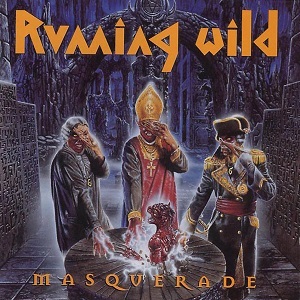 I can’t remember when I first heard of Running Wild, but it must have been around 1999-2000. I was already a huge fan of Megadeth, Metallica, and Iron Maiden and I was hungry for new discoveries. I bought whatever heavy metal magazine I could find – some local, some international – just so I could find out what other bands were out there. One of the bands that kept coming up was Running Wild. I don’t remember where exactly I heard of them first, but I remember walking into a record store (remember those?) and getting excited when I saw an album of theirs: Under Jolly Roger. It had this badass cover and I was just dying to hear the music. Remember, this was before we could sample any music we wanted; I didn’t know a thing about what the album was going to sound like! But then again, that mystery had its own charm. I bought it and was blown away upon first listen. The first thing you noticed was the sheer energy! You just couldn’t escape it. The title track and Diamonds of the Black Chest were instant favorites for me. I remember obsessing over the album for weeks! The music wasn’t super complicated, it was mostly around one or maybe two riffs, but they were catchy. And, of course, there was a lot of emphasis on the choruses. Everything sounded like an anthem of sorts. I didn’t know much about pirates at the time or whatever Running Wild was talking about. All I knew was that this sort of heavy metal was something I hadn’t heard before and I was enjoying how massive everything sounded. The natural next step was getting another album of theirs. I can’t remember why I picked Port Royal; maybe it was the owner of my favorite record store at the time that recommended it or perhaps I read about it in another magazine. But that’s what I picked. Without even hearing a single note, the album cover automatically took me to another era. Right there, I was in some pub in some dark European alley, drinking with my mates and waiting for my next voyage. I have no idea if that’s what they intended to portray but that’s the image I had on my mind. And if you start listening to the record, the first thing you’ll hear is a bunch of guys chatting loudly, at one point all chanting “Under Jolly Roger”, and it solidifies the image you’ve already built in your head! And then it leads into the melodic masterpiece that is the title track. That album is my favorite from Running Wild. A lot of people will cite Death or Glory as their number one (and it is a great album for sure!) but for me, Port Royal is their crown jewel. I definitely want to talk more about Port Royal and some of the band’s other albums, but before we get there, let’s acknowledge the person behind all of this: Rolf Kasparek, a.k.a. Rock ‘n’ Rolf. He is the main songwriter in the band and the only remaining original member at this point. Throughout the band’s long career, he assumed guitar and vocal duties, and I’m sure he had a hand in a lot more than that. It is fair to say there have been some other members that contributed to the killer sound of the earlier records, like Majk Moti and Hasche. But if you look at songwriting credits in earlier albums, Rolf’s name dominated. 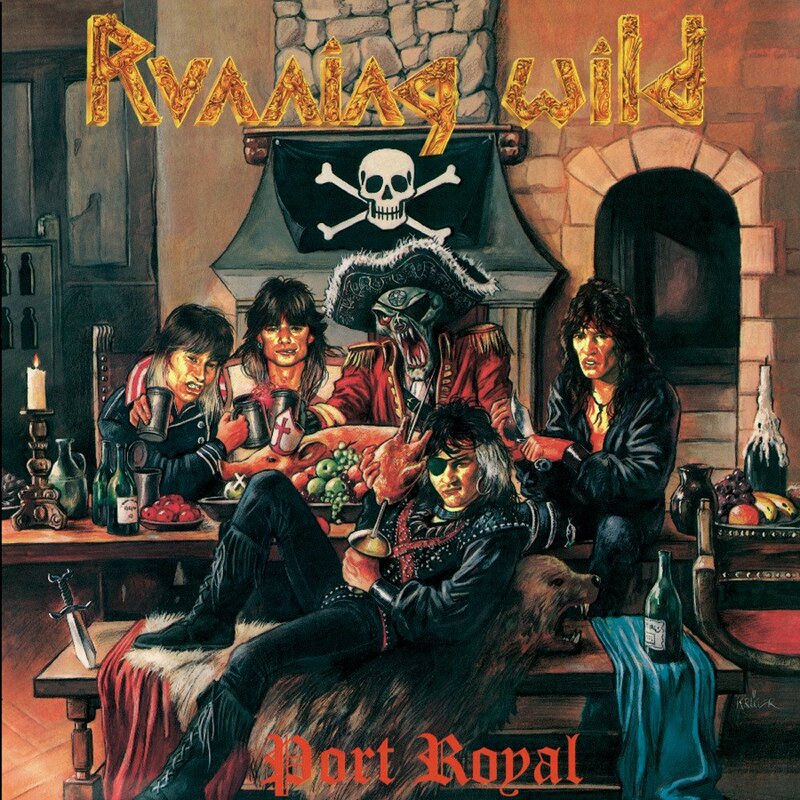 In other words, with all due respect to every member that has contributed to Running Wild, it’s kind of always been Kasparek’s vision and music that guided where this group of pirates was going. 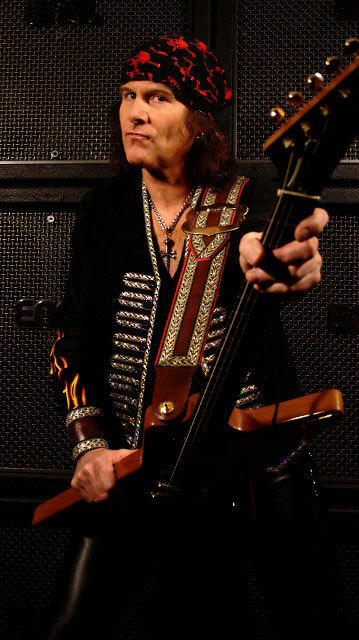 His vocals were raspy which enabled him to deliver the aggression most of his songs called for, and his rhythm guitar skills were top notch; he didn’t create complex riffs, but his timing and phrasing were just as good as the big rhythm players of the era like Rudolf Schenker and Malcolm Young. 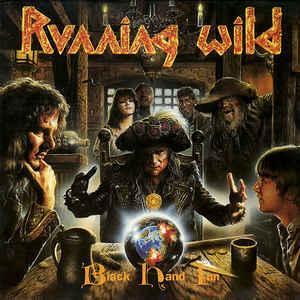 Running Wild is a part of the iconic German hard rock / heavy metal scene of the late ‘70s and early ‘80s. Rolf and some of his friends formed a band called Granite Heart which, in a few years, evolved into Running Wild. They were heavily influenced by bands like Judas Priest, Kiss, Thin Lizzy, and AC/DC. They wanted to be like them – they wanted to create riffs that were memorable, but they also wanted their image to be as recognizable as their music. You can hear the melodic influences of all these bands, but ultimately Running Wild carved its own path and created its own sound. The success Running Wild enjoyed later in the ‘80s can be traced back to their perseverance in the Hamburg metal scene. The band was working hard, playing gigs and submitting their demo tapes everywhere they could. After a while, they managed to get the attention of Noise Records, which ended up releasing their debut, Gates to Purgatory in 1984. The album sounds like a band trying to find their identity but haven’t gotten there yet. It sounds more like Venom than what Running Wild came to be known for. There wasn’t much talk about pirates or other historical topics Rolf likes to write about, but rather the band adopted lyrical themes that were in line with a lot of the bands coming out at the time; like some satanic themes, anarchy, and lyrics influenced by theology. The reason I never gelled with this album so much is that it’s missing that energy I was talking about earlier. The songs have decent melody and some good leadwork, but, for the most part, it doesn’t grab your attention the way their later albums do. It just sounds like a lot of other metal acts of the same era. In a sense, this is Running Wild paying tribute to their influences. The next year saw the band releasing Branded and Exiled. In a lot of ways, it is similar to the debut, but we slowly start hearing where the band is about to go next. The production is a lot cleaner and you get hints of the big drum sound Rolf loves to incorporate. The title track is one of my favorites from them – it easily could have been in one of the later classics. The album, overall, still falls short when you compare it to masterpieces like Death or Glory, but I think it’s a lot better than it gets credit for. Rolf sounds more comfortable and confident as a vocalist, and his style is slowly taking shape. You’ll actually hear similar vocal styles from him in the follow-up. 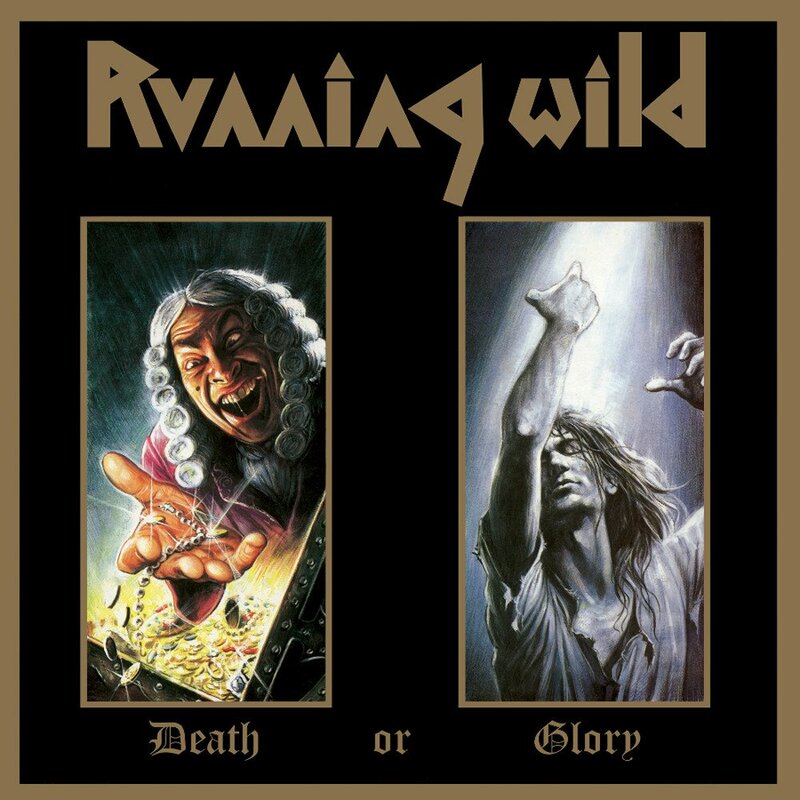 This one and the debut often get overlooked, and I understand because these don’t yet show the trademarks of Running Wild. But give them a listen for what they’re worth. Especially Branded… has a lot to offer. Now, we are at a part of this article where I get to write about exactly why I cite this band as one of my favorites. The next 3 albums they did, to me, are some of the best metal records you will hear. Most people would call their genre “power metal”; others might say it’s “pirate metal”, a genre that Running Wild apparently created. Both sound correct – but then again, I don’t really care for genre labels. All I know is by the time Under Jolly Roger was released in 1987, there was no identity crisis anymore. This band now knew what they were going to do. Their sound was going to be their own and they were here to deliver exactly that. Under Jolly Roger is where the band starts talking about pirates. In an interview with Iron Fist Zine, Rolf says he was just interested in the topic and brought the song idea (the title track) to the band, who liked it as well. In general, the album offers a much more structured, focused, and energetic songwriting. The riffs and melodies are a lot catchier. The drums sound big which contributes to the energy I will forever talk about when it comes to this band. The pirate stuff is interesting for sure, but it was the music that grabbed my attention a lot more than the lyrics. You could call it power metal to a degree, especially when you think of how anthemic most choruses sound. But when you think of bands like Blind Guardian, Hammerfall or Rhapsody, this band sounds nothing alike. 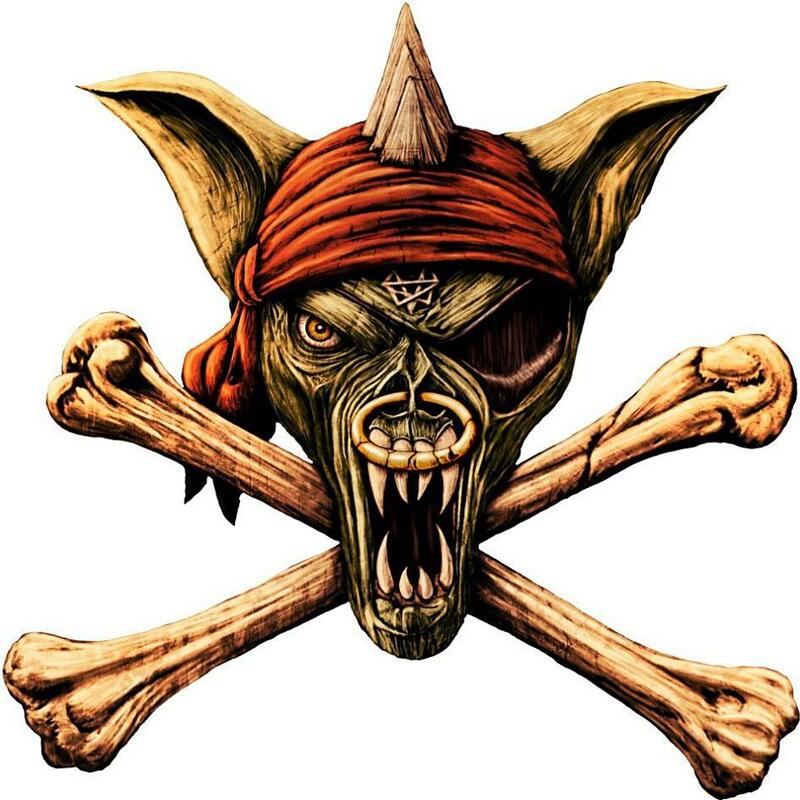 I guess that’s why people just started calling their music “pirate metal” – because it doesn’t sound like anything else! Plus, you know… pirates! Under Jolly Roger, Diamonds of the Black Chest, War in the Gutter, Raw Ride, Merciless Game are all stellar tracks here. And even with the lyrics, yes, they were definitely talking about pirates and you could argue that was the main theme. But Rolf has always talked about political corruption and the environmental damage too. This album is no exception – take a look at Merciless Game! In a lot of ways, this was the turning point in the band’s career. Everything they did afterward, despite some changes here and there, followed the formula that originated from Under Jolly Roger. It’s really hard to follow a breakthrough album but these guys managed it! Port Royal (1988) is a perfect album, as far as I’m concerned. It’s one of those records that gets better with each listen. The songs are still heavy and have the punchy Running Wild sound, but there is a lot more emphasis on melody. You hear that immediately in the title track; its intro is one of those iconic heavy metal intros. I’ve read online that some people complained about the mixing – it never bothered me, but in case it bothered you, there is a remastered version on popular streaming services – give that a listen! I hear a band that is laser-focused on their goal of delivering an album that has memorable riffs, solos, and substantive lyrics. I don’t even know how I can highlight some songs here – I love them all! Just listen to Into the Arena and tell me the melody isn’t beautiful! The album title comes from the place where the famous pirate, John Rackham, a.k.a. Calico Jack, was hanged in 1720. The significance of Calico Jack wasn’t just that there’s a song on the album dedicated to him and the album title comes from a place that is associated with him, he also designed a version of the pirate flag, otherwise known as a Jolly Roger. (Note: I’ve read different accounts about this. Some say he designed a version of it, others say one of his friends in his crew did. Suffice it to say, when it comes to pirates of the early 18th century, Calico Jack was a monumental figure.) The lyrics, once again, dealt with pirates and their story, but it wasn’t just about that. Conquistadores and Uaschitschun deal with completely different matters – but they’re all in Rolf’s realm of interests. This album is just phenomenal, in every way you can imagine. And if you still haven’t heard it, you’re missing out! Then came Death or Glory (1989). 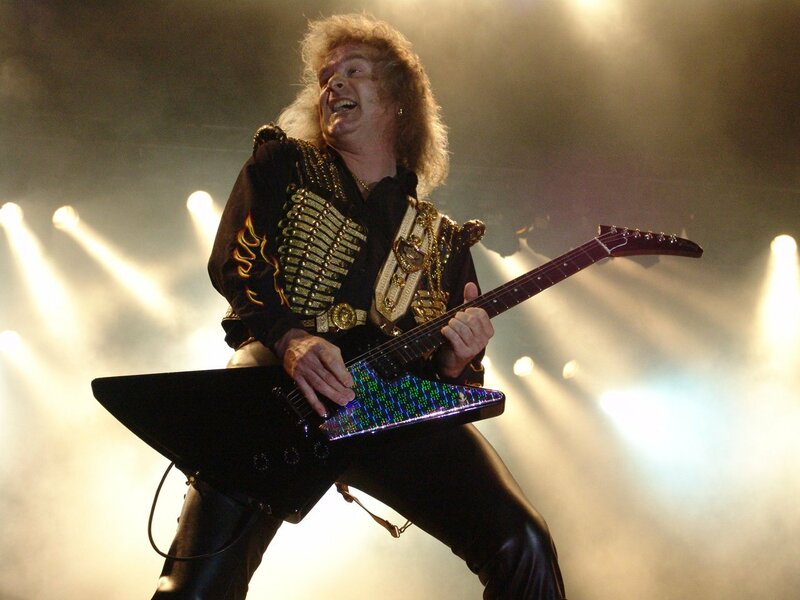 Year after year, Running Wild was on fire! If you’re not familiar with the band, you’ll usually hear about this album more than any other. Most fans cite this as their favorite. Like I said, it most certainly is a fantastic record. The reason why this isn’t my favorite has more to do with how much I love Port Royal than anything else. With Death or Glory, once again you hear even more improved production. The band was getting more popular; so, they could create an album that sounded as good as the technology of the day allowed! The songwriting is diverse, there’s fast tracks like Riding the Storm or Bad to the Bone, but you also have slower epics like Battle of Waterloo. And perhaps therein lies the charm of Death or Glory. This is where the band wasn’t afraid of playing around with song structures. There is more diversity in the songwriting on this record than its predecessors, but you still get the same – at this point the traditional – Running Wild sound. The raw energy, the melody, the aggression, history and pirates, were all there. In a lot of ways, this is the album where the guys honed their sound and allowed themselves to dig into new territory. Riding the Storm, Renegade, Marooned, March On, Bad to the Bone, Death or Glory, Battle of Waterloo are all incredible. They all showcase how you can infuse a lot of melodic licks into your songs and still make it as heavy as they need to be. Bad to the Bone, in particular, is such a fantastic song – both musically and lyrically! 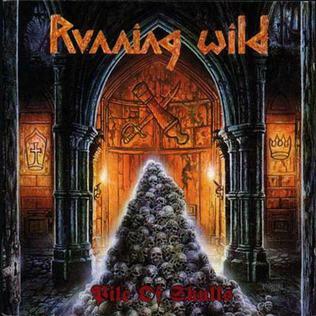 Running Wild is still active today, despite a 7-year hiatus after their “farewell” performance at Wacken. Since their start, they’ve released 16 studio albums. So, obviously there’s a lot to say about all these songs! But I want this article to serve as my tribute to one of my favorite bands. Maybe I’ll do a more detailed article for some of my favorites from them later. But suffice it to say, the main reason I love this band is based on the legendary 3-album streak they had between 1987 and 1989. I’ll start with my favorite from the post-Glory era: Masquerade (1995). I keep reading that sales for this album were poor, which goes to show you sales is never the right metric to judge an album’s worth. Masquerade is fiercely heavy, fast, and just downright brilliant. It’s an album that mainly talks about good versus evil, a theme Rolf followed in some of the later albums too. What I love here is the production; the drums are massive (Jörg Michael did a great job with the playing too! ), and the guitar sound is super tight. Some may have issues with these; especially the guitar sound may bother some because it’s super trebly which can be irritating. I like it because it creates a good contrast with Rolf’s lower pitched vocals and allows the drums and bass to shine. It won’t work for every metal band, but it worked for Running Wild. This album doesn’t sound anything like Port Royal or Under Jolly Roger but remains loyal to some power metal elements like faster tempos and anthemic choruses. 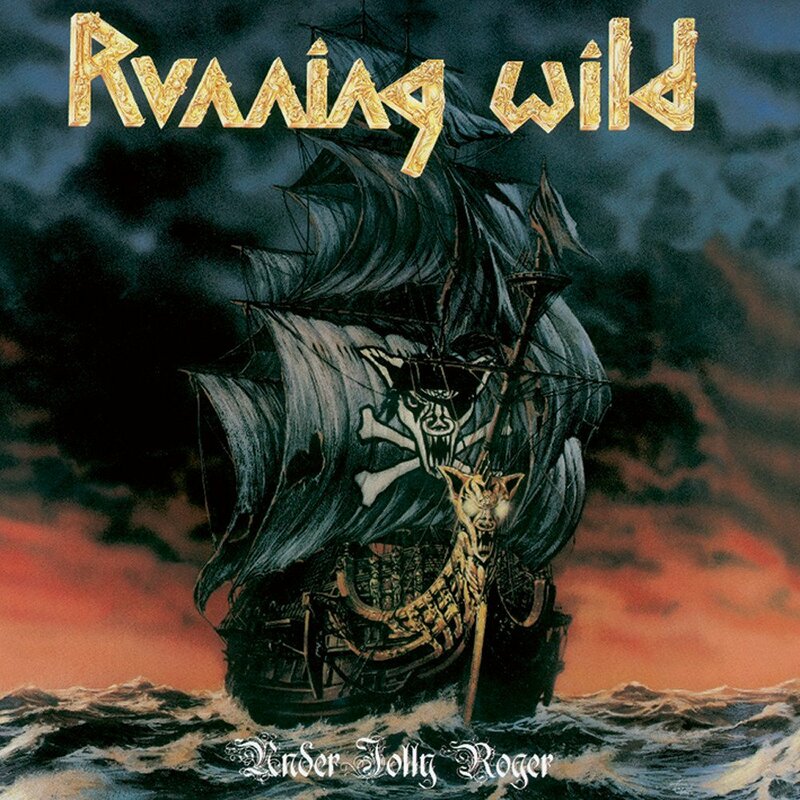 The title track, along with Black Soul, Lions of the Sea, Rebel at Heart, Metalhead, Soleil Royal, and Men In Black are all excellent songs and great additions to the Running Wild legacy. Black Soul, in particular, is such a great track! I regard Pile of Skulls (1992) and Black Hand Inn (1994) in a similar fashion as Masquerade. These albums came earlier and, in some ways, were early signs of the direction Running Wild was about to follow. The reason why I grade them a little below Masquerade is that I often get the sense that the songs end up sounding very, very similar to one another despite changes here and there. I don’t mean to say they are bad songs by any means, but even after years of listening to these, I feel like one song blends into another because they follow a similar formula. It’s not something I get with Jolly Roger, Port Royal or some others I’ve highlighted. But, these two are still underrated because I think there are some really strong tracks. Sinister Eyes, Lead of Gold, Pile of Skulls, and Treasure Island from Pile of Skulls are great examples of how Running Wild can infuse power metal with groove, and occasionally, speed metal. The title track, in particular, is one of my all time favorites from them and certainly a track to satisfy guitar players! From Black Hand Inn, the first 4 tracks are all excellent, as far as I’m concerned. Especially the opener, The Curse, and the title track set an excellent tone. And then there’s the 15-minute epic, Genesis (The Making and the Fall of Man). At times, it really feels like a Blind Guardian track, to the point that I sometimes expect Hansi Kürsch to sing a verse or two… In general, this is a territory that Running Wild rarely crosses into. You know I always argue to err on the side of streamlining songs as much as you can, but I think Genesis was executed flawlessly because it doesn’t repeat the same thing too much. Oh, and Black Hand Inn has a really cool concept too if you’d like to follow the lyrics! I must admit, I lost touch with Running Wild for a bit over the years. I didn’t know much about the albums that were released after Masquerade. After not following them for a while, I saw the news that they were retiring, and their last show was going to be at Wacken. That was 2009. That’s when I did some research and listened to some of their records post-1995 and pre-reunion. In full honesty, I don’t know those records as well as I do the rest, so I will steer clear from making comments. The only thing I can safely say is that they didn’t grab my attention the way other records did. Who knows, maybe in a few years I’ll see them differently but I’m just not there yet. Running Wild’s last studio album before the hiatus was Rogues en Vogue (2005). After 7 years, Rolf came back with Shadowmaker (2012) and has released two more after that; Resilient (2013) and Rapid Foray (2016). Of course, these were all released under the Running Wild name, but at this point, it is just Rolf Kasparek and musicians he hires to fulfill whatever duty remains on the table. I thought Shadowmaker was a really cool album – especially for someone who was coming back after 7 years of no studio albums. It’s more hard rock than power metal; maybe that’s why some didn’t like it. But I like it precisely because of that; not that I don’t like power metal, I obviously do! But it’s a dangerous trap some musicians set for themselves when they feel the “need” to release an album under the same formulas. The two albums that followed, Resilient and Rapid Foray weren’t my cup of tea. Yes, they were more in the vein of what Running Wild is known for; but the production was weaker and, with the exception of some great songs, applied and delivered the same formulas. He even wrote a song called Stick to Your Guns and called his scene a “musical war”. If you need to get that defensive about your writing, I think even you’d have to admit you are following a certain recipe. Having said that, make no mistake; I’m thrilled that Rolf is back and active. I think he’s got plenty of great riffs left in the tank. And, yes, there are some interesting songs in these last couple of albums, but I keep feeling like Rolf is happy to follow a formula that has worked for him for decades. However, formulas don’t write songs, people do. Running Wild is his baby, so he can do whatever he wants to do, and I know from reading reviews online that some people are perfectly happy with anything he releases; but I guess I’m not in that camp. The genre they created – what set them apart from other bands earlier in the career – ended up dictating what gets written. Their most recent music still has plenty of great riffs and melodies to offer, but I miss listening to an entire album and feeling like every song delivered something unique. I guess I’m just hoping that we get a little more diversity from the body of music with the next release. Shadowmaker (2012) was a great step in that direction. As far as I know Running Wild is still active. It’s hard to find updates from them and Rolf doesn’t do a lot of interviews, but everything suggests they are active. I have my fingers crossed to hear new music! This band is one of my all-time favorites and I thought I would do this article as a tribute. Under Jolly Roger and Port Royal will always be two of my all-time favorite metal albums! A lot of other albums and songs also mean a lot; not just to me, but to lots of other dedicated fans. Running Wild is one of those “legendary” bands. I just wish more people were aware of them. A great review about Running Wild, one of my favorite bands! I am a travel blogger and I am into adventure travel. And there is no other metal band which inspire travel and adventure like Running Wild. Especially travel on the sea, combined with history! And I agree with you, their 3 great albums from 1987 to 1989 were the best (especially Under Jolly Roger, where Rolf sounds like a really bad and angry pirate). Unfortunately, even they (or most likely Rolf Kasparek) are active now, I don’t think we will ever hear something like their classic. Rolf’ s voice is not the same as before, we all getting older. Anyway, these guys did a great job during the last 35 years! Thanks so much for reading and commenting! I hear you about listening to Running Wild while traveling. They definitely have that energy that gets you excited. There are some gems in their newer material, but I’d have to agree with you, I just can’t hear the magic of those 3 great albums from earlier. Still, they’re one of the greatest metal bands and I hope more people will be aware of them and Rolf, in particular.